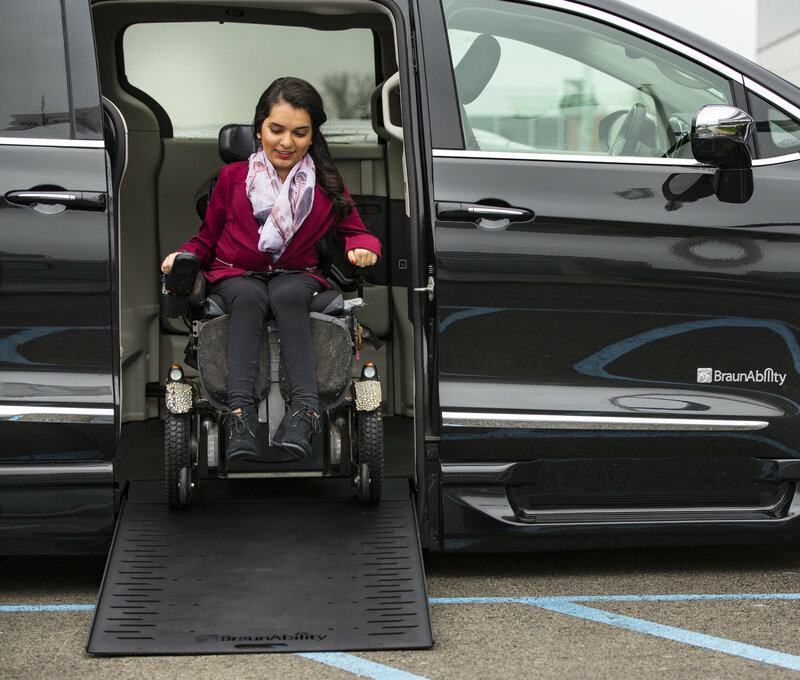 Healthy Habits for Power Chair Users | Custom Mobility Inc.
2019 is the year to save time and money, to look great, and to reduce stress! Think of your equipment as a lifeline. When making appointments for social, work, or school-related functions, nobody wants to get stranded because of a flat tire or a breakdown. What can you do to prevent it? • We can’t always avoid hazards to our wheelchairs. That’s how accidents happen. Accidentally rolling over items that can puncture tires are very dangerous. Try your best to avoid nails, glass, and tall grass, which may hide sharp objects. • If you hear any, unusual noises, such as squeaking or grinding, these may indicate that something is wrong. • Try to check the hardware on your wheelchair. If any pieces are loose, you can try to tighten them, or ask somebody to assist with this task. You should always check your owner’s manual for further clarification. If you have additional concerns and either feel uncomfortable, or are unable to make the necessary adjustments, please give us a call. o Checking the motor may only take a second, but can tell you whether or not it is engaged. o If your joystick or batteries seem to be acting wonky, checking any connections may resolve these issues. o Though it may seem obvious, it’s important to check your battery’s level of charge; the indicator for your battery life may be reading incorrectly. We can determine if that’s the case. o We’ve all made silly mistakes. One of those might be that you’ve forgotten to charge your wheelchair. It certainly happens! If you notice that your wheelchair isn’t charging, double-check to make sure that the charger is plugged into both the wall, and your wheelchair. o Try your absolute best to stay out of the rain. o Though it might be tough, try to park your vehicle in a covered area. o If the downpour is unavoidable, covering your joystick is always a great idea. To accomplish this goal, place a clear, plastic bag, over the top of your joystic. Be sure to always carry one, just in case. Oh, and make sure that the plastic bag doesn’t have any holes! o If you end up getting wet, and if possible, disconnect one of the battery connectors. This precaution may prevent further damage from occurring. Afterward, and as soon as possible, please give Custom Mobility a call. That way, we can make sure that you and your wheelchair are safe. We may also need to schedule a repair, or immediately arrange for you to come in. o Rain ponchos can get caught in wheelchair tires, so they can be dangerous. A fitted, rain coat, may be a safer alternative. o To ensure your safety, make sure that that your joystick operates freely. Hence, the above precaution. Making certain that the joystick returns to its center is really important; otherwise, your wheelchair will continue to move, even if you don’t want it to! o Sometimes, the cap of your joystick may fall off. In that case, and if it doesn’t fit back onto the joystick’s post, please don’t attempt to reattach it with glue. For a temporary fix, wrap the post with Scotch tape, which will give the cap less room to wiggle around. 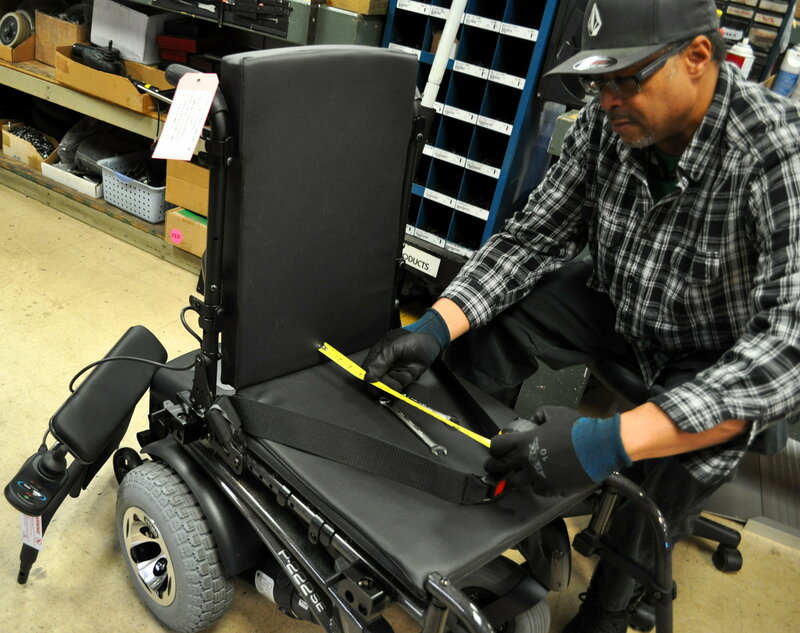 o Believe it or not, this process can be extremely harmful to your wheelchair’s battery and may even shorten its lifespan. Battery replacement is one of our most common-repairs. o Typically, a battery is supposed last between 2-6 years. o Though wheelchair chargers are supposed to prevent overcharging, they often don’t. o If you are a daily wheelchair user, it is recommended that you charge your batteries every night. o If you aren’t a daily your wheelchair user, we recommend that you charge your wheelchair weekly. o Try not to leave your wheelchair plugged into the charger for an extended period. o If it is difficult to keep track of your charging cycles, timers or smart home devices can do this for you. o To make sure that you are as safe as possible, it’s important to remember that your wheelchair is not like a superhero. It has limits. o Wheelchairs are designed to function in a very specific way. If you add extra weight to your chair, no matter how little you may think it is, there is a potential that it could have a negative impact. o You can certainly use your chair to carry bags and purses, but make sure that you don’t overdo it. And don’t hang items from your joystick. We promise, that’s the last time we’ll mention it. o Lastly, treat your wheelchair like a temple! It was designed to carry you, and only you, so be careful about picking up hitchhikers! o If the chair isn’t driving quite right, you may just need a simple, programming change. o Since power wheelchairs require expensive programmers, it would be difficult and dangerous to make a programming changes on your own. Luckily, Custom Mobility is here to help! o Like people, wheelchairs need regular check-ups. If your power wheelchair feels jerky, is turning too quickly, or is accelerating too fast, a quick, a check-up might be just what you need. • Error codes, blinking lights, and numbers? o These indicators could mean that your wheelchair is very angry with you. Actually, it’s probably mad at us. Either way, you should bring it in, immediately. Nobody likes an angry wheelchair, especially us. o If your chair is kind enough to offer you an error code, blinking light, or numbers, it’s trying to tell you something. Please record these indicators so that our service technicians can help. 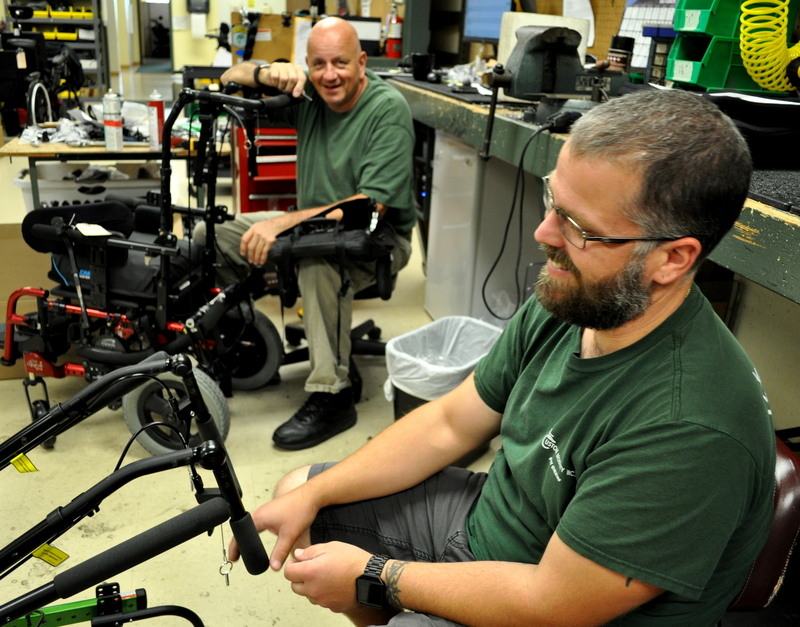 Unlike most people, our techs speak fluent, power wheelchair. o Though frustrating, these issues may be related to something as trivial as a loose connection. o What’s that phrase? The squeaky wheel gets the oil? Drive wheels should not make noise or be wobbly. If they do, then we probably need to look. 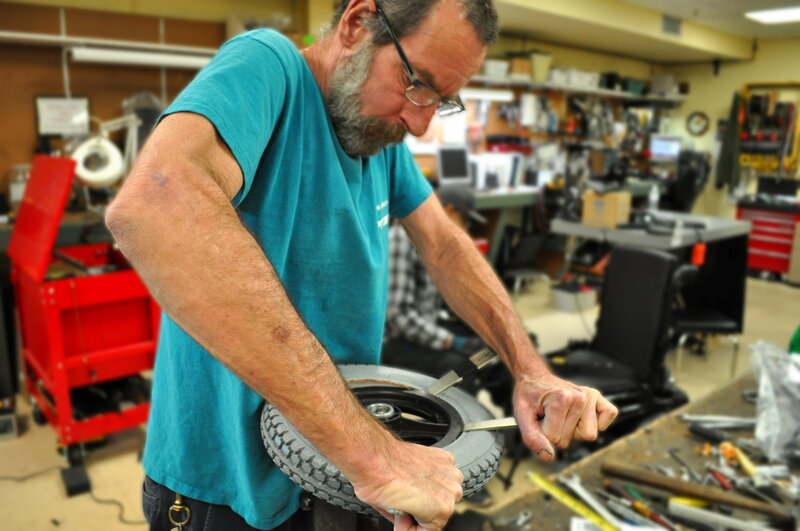 o Like all tires, your front casters will eventually wear out. When your casters start to bald, we replace them with new ones, which is usually a quick and easy repair. o We can take care of these pesky sounds for you; however, you might not want to make the trek to us for this kind of issue. In that case, you or a caregiver can apply lubricant to the squeaky area. If you do opt for self-maintaining this annoyance, be sure to use a silicone-based spray. Be sure to avoid spraying any rods, shocks, and actuators; otherwise, you could run into an entirely different problem. Let’s stay as far away from that as possible. 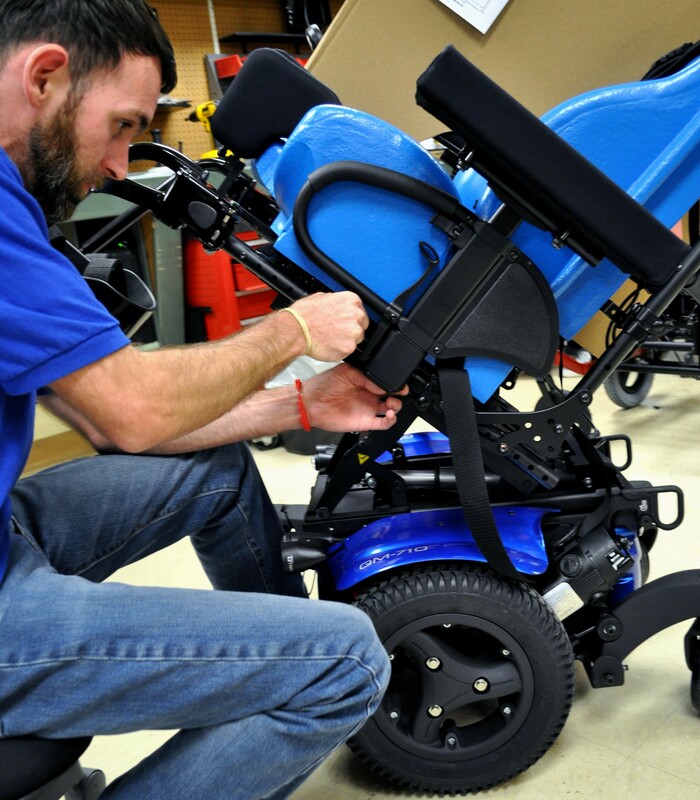 At Custom Mobility, we have a fully-equipped repair shop, staffed with expert wheelchair technicians. Together, we can help you stay on track. Though you don’t need an appointment, we recommend that you call, prior to your visit. This step will allow you to check the wait times and will give us time to prepare for your arrival. Our service hours are 8:30-4:30, Monday through Friday. 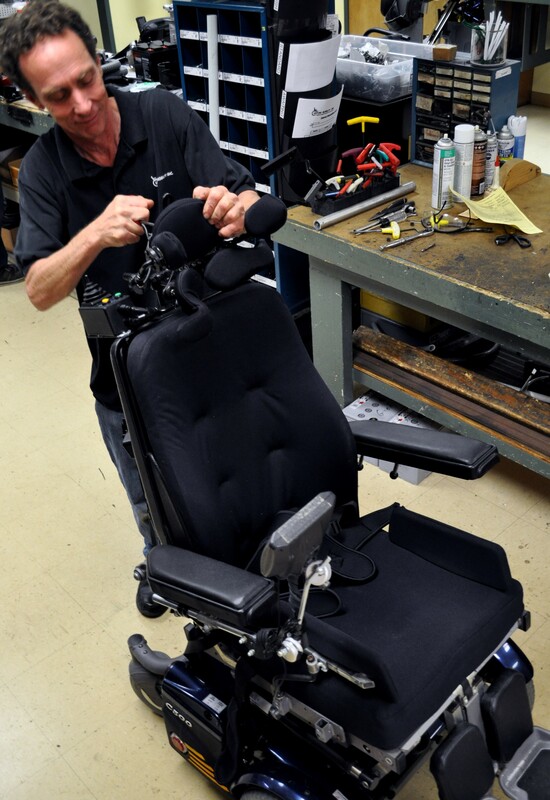 Our main priority is to fix your chair as quickly and economically as possible. As soon as you arrive, our friendly, customer service staff will greet you, will write up a work order, and will provide you with an estimate. At that point, all that’s left for you to do is relax in our comfortable waiting room, which has free snacks and beverages. What can we say? We aim to relieve your stress, especially since repair to your wheelchair can feel like such an overwhelming ordeal.